After over 23 years, Bell Films is proud to make its comeback into the realm of film production as it strives to enter the digital age of quality and relevant Filipino films. 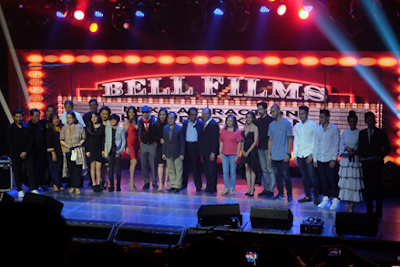 Bell Films was one of the early independent film production outfits that brought international quality films to the Filipino audience way back in the 1960s. The company has also produced films such asTwin Fists for Justice (1974) starring Ms. Vilma Santos and Hong Kong Martial Arts Superstar/Actor Meng Fei, and two movies featuring the Universal Motion Dancers: Sige… Ihataw Mo! (1994) with Claudine Barretto and Wowie De Guzman, and its sequel Ibigay Mo Ng Todong-todo (1995). The event also served as the media presentation for Bell Films’ 2018 debut production, Kontradiksyon starring Jake Cuenca, Kris Bernal, John Estrada, Paolo Paraiso, and Elizabeth Oropesa, among many other stars featured on the film. The action film, which is directed by multi-Palanca award-winning Writer Njel De Mesa, is set to be an intense ground-breaking, in-depth, critical, and edge-of-your-seat look on the Philippines' current drug war. which will have the audiences see the various aspects and opposing views of the big issues in the country. The film is expected to premiere later this year.